List of Bangladeshi newspapers and Bangla news sites including Bangladesh Pratidin, BD News 24, BD 24 Live and Bangla News 24. Regional Bangla newspapers are sorted by cities. Despite the growing popularity of Bangladeshi news websites, Bangla newspapers print versions are highly trusted. Following is a list of Bangla newspapers. It is one of the highest circulated Bangladeshi newspapers. With a huge readership, Bangladesh Pratidin is counted among the leading newspapers in Bangladesh. Another popular Bangla newspaper, circulated all over the country. Daily Bangla newspaper providing quality news and information. Ittefaq is the oldest daily newspaper in Bangladesh. It is still popular among the readers. Tabloid format newspaper based in Dhaka, Bangladesh. Daily Bangla newspaper owned by Globe group. 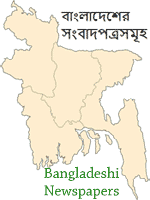 Bangladeshi newspaper was founded in 2004. Daily broadsheet, with latest news, headlines and analysis. Featuring sports, business, culture, education, and more. Daily newspaper based in Gulshan, Dhaka. Daily newspaper, with coverage of national and international news. Daily newspaper published by Deshbandhu Group. Source for latest news, business, sports and entertainment. Daily newspaper published from Dhaka. Providing Bangla news headlines and stories. Bangla newspaper published from Dhaka. Breaking news, sports, entertainment and more. Bangla newspaper, with business, lifestyle, and sports news. In Bangladesh there are thousands of Bangla news sites constantly providing updated news and information. bdnews24, bd24live, banglanews24 and banglatribune are the largest Bangla news sites. Most of the national daily newspapers in Bangladesh are published in Dhaka. Other big cities including Chittagong, Sylhet, Rajshahi, Khulna and Comilla also published few daily newspapers. However almost all other cities have at least one local print newspaper as well as Bangla news websites. A local or regional newspaper serves a region and plays an important role in the local communities. During the past three decades, the number of English-language newspapers in Bangladesh has been increasing because of literacy and economic growth. Regular sections of the newspapers are opinion/editorial, politics, business, sports, education, and entertainment. Largest circulated English-language newspaper in Bangladesh. The Daily Star is the member of Asia News Network (ANN). National daily newspaper, published from Dhaka. Daily newspaper based in Dhaka. Leading English language newspaper published in Bangladesh. Bangladeshi daily newspaper, founded in 2010. Leading source of financial and business news. Daily newspaper published since 2011. Providing latest breaking news, features, analysis and more. English-web edition of Bangladesh’s oldest national newspaper the Daily Ittefaq. Newspaper published by Newscorp Publications Limited. Energy, environment and electricity news. BSS is the national news agency of Bangladesh. It was founded in January 1, 1972. BSS has correspondents in all 64 districts of the country. It is a private sector news agency. ENA is a privately-owned news agency in Bangladesh. Daily Star, New Age, and Independent are top selling English-language newspapers in Bangladesh. Best Web Hosting in Bangladesh. High performance VPS & Dedicated Servers.